If you're civic-minded, politically engaged, or just want to get more insight into the well-being and future of Charlotte, there's a great event coming up that you should mark your calendar to attend. An Evening with Charlotte's Mayors is a free public forum, taking place Tuesday, May 21, 7 p.m. at Dale F. Halton Theater at Central Piedmont Community College (1206 Elizabeth Ave.). 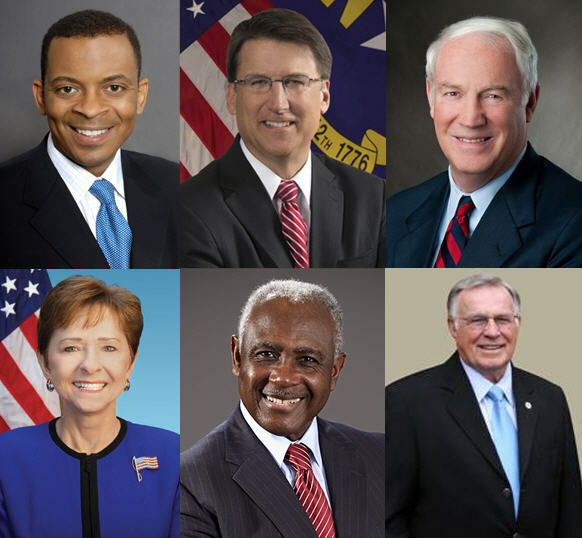 All six of Charlotte's living mayors will be on the panel: current Mayor Anthony Foxx (who's leaving his post soon to join the Obama Administration) and former mayors: North Carolina Gov. Pat McCrory, Richard Vinroot, former U.S. Rep. Sue Myrick, Harvey Gantt, and Eddie Knox. Charlotte mayors present and past. Top, left to right: Mayor Anthony Foxx, Gov. Pat McCrory, Richard Vinroot; bottom: Sue Myrick, Harvey Gantt, and Eddie Knox. The forum is billed as an "historic discussion [that] comes at an intriguing time in Charlotte's history. A crucial mayoral election looms while concerns swirl over the city's future: growth without annexation, the widening gap between the affluent and poor, and rising tensions over control of the airport and a persistently high unemployment rate." Award-winning documentarian and TV journalist Steve Crump will moderate the evening, and audience members will be allowed to ask questions. The event is free to attend, but registration is required by clicking here. Doors will open at 6 p.m., the forum begins at 7, and a dessert, wine, and coffee reception will follow. The event is sponsored by The Charlotte Observer, PNC Bank, and CPCC.